It's a party on the island of Gouga! A beautiful cake has been prepared. Mmmh... Only, the children are not here! They've all gone to play in the jungle... And the joker monkeys, as greedy as they are naughty, are getting ready to eat the cake. Hurry up and find all your friends the little Cro-Magnons and the Dodos, those funny big birds! Because if you're not back in two minutes, the cake will be eaten entirely by the monkeys! The cooperative atmosphere game for children! 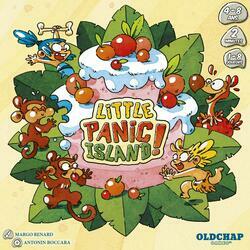 In Little Panic Island, children are immersed in a cooperative game that combines memory, speed and crazy gestures, all in... 2 minutes! Progress together in this evolutionary game with 3 levels of difficulty. Each level will be an opportunity to discover new traps, up to the famous surprise trap. A very funny atmospheric game that follows the principle of his elder Panic Island, but this time designed for the little ones. A game lasts 2 minutes. The rules do not change according to the number of players, even if you play alone. It is the most greedy player who begins to play. As soon as you are all ready, turn the hourglass over or start the soundtrack (see page 2). Hurry up, the game has just started! Ready to have some fun? Then go for it!